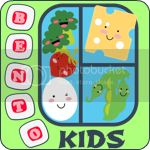 Bento for Kidlet: Let's all just get along! When I first started making bento, I did it badly. I mean really badly. I was new and enthusiastic but my skills were not quite there yet. It took time and practice to become better. While I was learning I met lots of bento mamas with waaayyy better skills than I had. They could have torn me apart with my sad ugly bento lunches and I probably would never have made another lunch again. But they didn't. They chose to build me up and encourage me. I was inspired by them and learned so many new things. 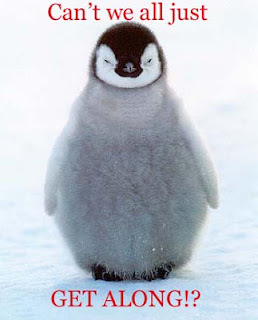 The world is full of a lot of meanness. We see school bullying becoming a huge problem in the media now. The internet is a wonderful tool but it can also bring with it a lot of hurt. Words are powerful. It doesn't matter if you speak them or type them. They make an impact....sometimes in ways we could never imagine. Recently, lots of my bento buddies and I have been seeing a trend towards negative comments about what we do. From the snarky to the downright cruel, people seem to think that anything that pops into their heads should be put down as a comment. Does it really matter to you if I have a job outside of the home? If I have one child or 10? We all have the same number of hours in a day and the great thing is we get to choose how we spend them. I like to make bento lunches for my son. I'm not asking you to make them. Do you have a right to be nasty and horrible to people? Yepp, you do. Does that mean you should do it? Uhm, no. Everyone in this world wants some of the basic things. We want to belong and have people like us. You don't have to like me or understand why I do what I do. We can all be polite even when we don't completely understand each other. I would like to see more people making a decision to build each other up instead of tearing each other down. It's not really so hard. So before you make a comment, just think! Will this be helpful or am I doing potential harm to someone? If it's the latter....maybe you could just pass on by without saying a thing. "before you make a comment, just think"
Well put, Jenn. I for one am sure your bento brings much more joy than negativity in this world. Thank you for sharing. I love your lunches! I am a new, wanna-be bento making Mom and I have gotten lots of inspiration from your blog. I'm sorry to hear that people have been rude. Your son is lucky to have a Mom that cares! NIcely said. I enjoy your lunches. Oh, a button would be cool. I am inspired by each and every bento I see. Be it design or content...I am always looking for new ideas! Jenn, I LOVE and agree with what you wrote! Don't understand why people wanna act badly. I am not that talented in making bentos and thankful for the group of bento makers out there who leaves kind and inspiring comments so far. Wish everyone is like that. Very sweet, thoughtful and true! I have learned a ton from the mom bloggers & especially the bento group. It's important to show failures too since it means you're trying & taking risks! How else are you gonna learn? Kudos to you & rock those bentos, momma! There is enormous pressure to be the perfect parent. Sometimes all the mommy blogs make the rest of us feel like if we aren't cutting our kids up into perfect heart shapes, we are depriving them of a childhood. I came to this blog from a friends Bento blog, and while I sympathize I hope you all realize that your joy in making bento isn't always shared. Some days I just hope that I have enough money to buy milk for my kids. I love my friend, and I'm glad she likes bento. But she's making the rest of us feel like crappy parents. I don't know how to tell her without losing her as a friend. I am a recent "lurker" and have been making bento-style lunches for my kids for about 3 months! I LOVE your pictures and ideas, and it is fun to get different ideas/inspiration. 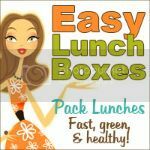 To me, it is worth a little more time and attention to have my kids eat their lunches! (You make time for what you really want to do!) THANK YOU for sharting with all of us! I've seen posts like that before. It reminds me of this blog post about the "Elf on a Shelf" during Christmas. A mom was irritated with the mom's who went all out with silly things with their Elf. I personally love making bentos. I actually feel bad because I have slacked the past month or so. It's tough to pack lunches during your first trimester! Keep it up! I would've loved for my mom to make fun lunches when I was a kid. What a great post Jenn! Love the button idea Karen! And that THINK text is perfect Candy Girl!!! I'm making the button up right now. Such a great idea. Well said! We find time to do what is important to us. Some people like knitting, we like making fun lunches! Well Said. I have been lucky enough to not get any of those negative comments yet. but I never know when I might get one since I am nowhere near the master bento makers out there that make amazing art out of food. And sometimes I feel like just throwing some leftovers in a box and I know it's not pretty, but who cares? I usually don't comment on other people's blogs unless I have something to say. And usually I just go to look at the pretty pictures and maybe get ideas for my own bentos. 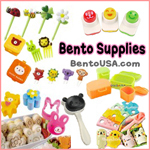 I've VERY new at Bentos and have been reading different blogs for ideas. I'm sorry that you have had negative comments! I agree with you so much - I've experienced nothing but kindness from those in the bento community, I just wish that others could be the same. Jenn. 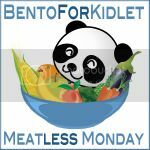 I absolutely Love your blog, Love your bentos and LOVE this post! Happy Valentine's Day, let's spread the love!